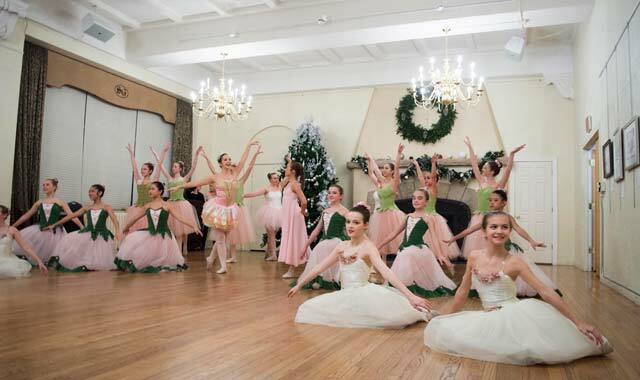 Ballet performances make up just one of many arts activities happening during Christmas at the Dole, in Crystal Lake. Fifteen years ago, Lakeside Legacy Foundation was little more than a vision of what could be. Created out of an effort to save Crystal Lake’s historic Dole Mansion and its surrounding property, this nonprofit organization and its leadership faced an enormous question as they started out: What do we do with this place? Lakeside’s artistic mission assembled rather organically, says Siobhan Cottone, executive director of Lakeside Legacy Foundation, which owns and operates Lakeside Arts Park at the Dole. Fast-forward 15 years, and there’s no doubt as to the vision and mission that drives Lakeside Arts Park at the Dole. Its status has been sealed as an inspiring community destination that uses art, education and celebration to positively impact lives. Visit on any given day, and you’ll experience a unique setting infused with visual, performing and culinary arts in many forms. Colorful works adorn the walls of two galleries. The sweet scents of paints stream from art studios. Lovely melodies bellow from “the Listening Room” and studios as musicians practice their craft. Youth chop, sauté and bake all sorts of delectable treats in the professional kitchen. Local nonprofits and businesses use the Arts Park’s studios, galleries, board room, kitchen, and other facilities for their own purposes and fundraising events. Creative Arts Inc. and McHenry County Youth Orchestra both rent studio and classroom space. Throughout the year, families and friends gather at Lakeside Arts Park at the Dole to celebrate First Friday Art Shows, concerts in “the Listening Room,” recitals, festivals and special events. One of the most anticipated of these events is Christmas at the Dole, a special event welcoming the holiday season. Scheduled for Dec. 1-2 this year, Christmas at the Dole promises not only a dazzling display of the arts, but a special tribute to the organization’s 15th anniversary. The entire family is invited to this year’s December First Friday at the Dole on Dec. 1, complete with artwork displays in two galleries, dance performances of “The Nutcracker” by The Berkshire Ballet Theater, madrigals singers and much more. Cottone predicts Santa Claus will make an appearance, too. In years past, December’s First Friday was followed by a Winterfest on Saturday. But this year, those events will be held on Friday so that that a special gala can be held on Saturday evening. Inside, guests will be greeted by actors portraying the family of Charles Dole, the home’s namesake and original owner. “Mr. and Mrs. Dole” will be joined by a grandmother and children, all in character, as they share more about the family’s and the estate’s colorful history. Guests can enjoy cocktails and passed appetizers on the first floor of the mansion, which will be decorated in Christmas spirit and completed with a special Founders Hall to recognize those whose efforts saved the property 15 years ago. During cocktail hour, a special silent auction will feature original art pieces and photography packages donated by Lakeside Arts Park’s artist partners and exhibitors. A plated dinner will follow in the grand Sage Gallery, and it’ll put guests up close with the artistic component of the arts park’s mission. The evening’s entertainment includes live musical and vocal performances as well as an artist creating original work set to music. The dinner portion of the evening will include remarks and community testimonials about the Lakeside Legacy Foundation’s anniversary. Following dinner, guests are invited downstairs to dance with big-band performers in “the Listening Room,” an intimate performance venue celebrating its fifth anniversary this year. Today, Lakeside Legacy Foundation’s mission and vision preserve and protect the historic Dole Mansion and Lakeside Arts Park for community use through innovative art education and community enrichment programs and events. Lakeside Arts Park is funded entirely through private donations – no federal, state or county funding – so the generosity of donors and sponsors is always appreciated, as their contributions support improvements to the mansion and property as well as year-round programming, says Cottone. Christmas at the Dole First Friday and Gala is just one way to support the mission. Admission to First Friday is free, though a $5 donation is suggested. Tickets for the Christmas at the Dole Gala, on Dec. 2, are $150 per ticket, or patrons can buy a table of 10 seats for $1,500. Purchase tickets and tables by calling (815) 455-8000 or visiting lakesideartspark.org. This entry was posted on Friday, November 3rd, 2017 at 12:00 pm	and is filed under Arts & Entertainment, Top Posts. You can follow any responses to this entry through the RSS 2.0 feed. Both comments and pings are currently closed.